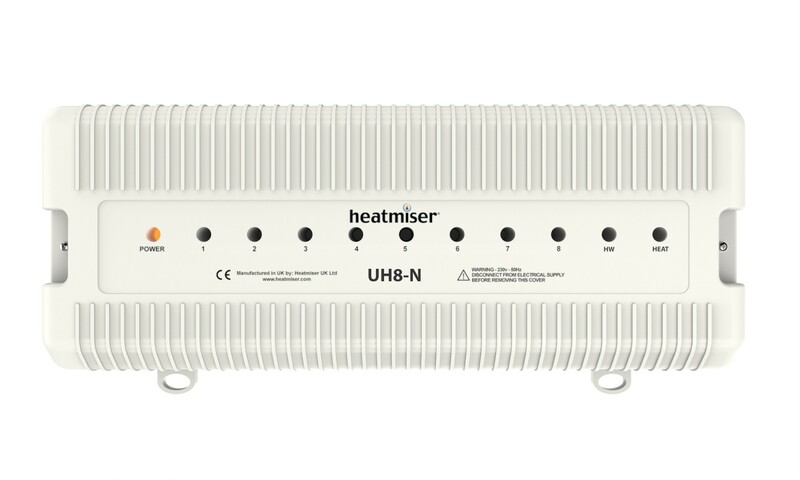 The Heatmiser UH1 8 Zone 12v Network Thermostat Wiring Centre provides central switching and is therefore ideally situated next to the underfloor heating manifold. A total of 8 Zones can be controlled as well as providing an output for a hot water cylinder. Radiator Option An option is provided on the UH1, UH4 and UH8 for a radiator zone to be controlled. When enabled, the last zone is setup for a radiator zone and therefore doesn’t enable the UFH pump, valve or boiler. On the UH8-RF this option is available per zone. Easy Installation The Heatmiser Wiring Centres offer an easy way of installing your underfloor heating system. The wiring centre is usually situated above the UFH manifold allowing easy connections to the actuators, UFH pump and valve.